Add a touch of sophistication to a simple favor. 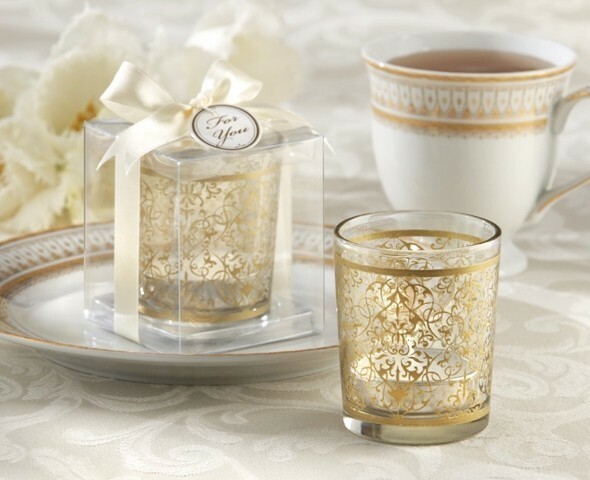 These golden glass votive holders have a wonderful artistic quality that sets them apart. These favors will catch everyone's eye! Personalized tags for your favors are available separately as Product Code: AK-31001NA-03-W. PLEASE NOTE: The pictured clear gift-box, bow and tealight candles are included. Sold as a set of four (4) and prices quoted below are per set. "Your service makes me feel that somebody's looking out for my interests. I appreciate your prompt attention to my personalized favors order, and the accuracy of your personalization." Jackie T.